I'm currently taking a handbuilding course from Alfredo Ratinoff at the Smithsonian Institution. The focus of the course is coils. No slabs or extruder -- the staples of most of my handbuilt work. Just coils. Coils was not one of my strong points (or interest points, for that matter) before the course, but it seems to have connected. Coil building is a relatively slow process -- something I've found I like. Here is the first piece I've made. 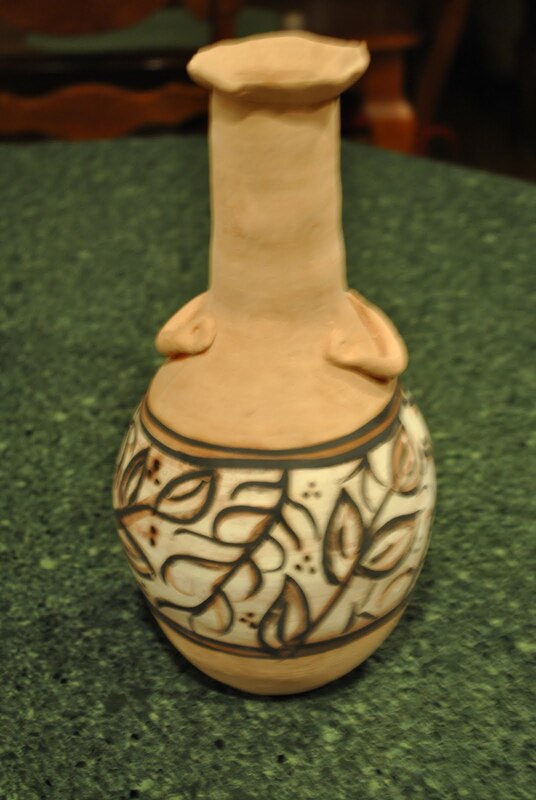 A coil-constructed vase made from low fire terra cotta clay and decorated with Alfredo's engobes. I am leaving the surface plain; no wax or other finish. The feel of engobes reminds me of old pottery and that seems to fit the form and the decoration. I've got a couple more being fired this week and will post pictures when they are done.